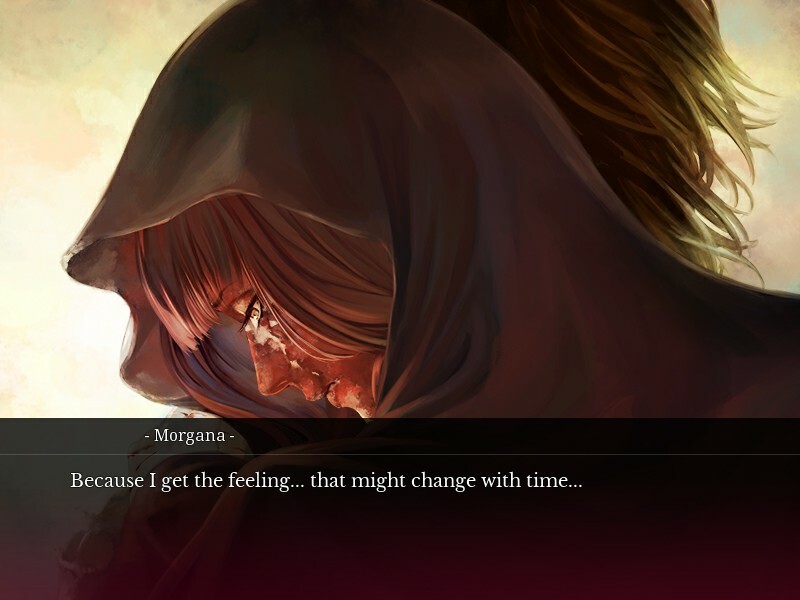 This review of The House in Fata Morgana: A Requiem for Innocence contains spoilers for the main game, The House in Fata Morgana! Read it before proceeding! 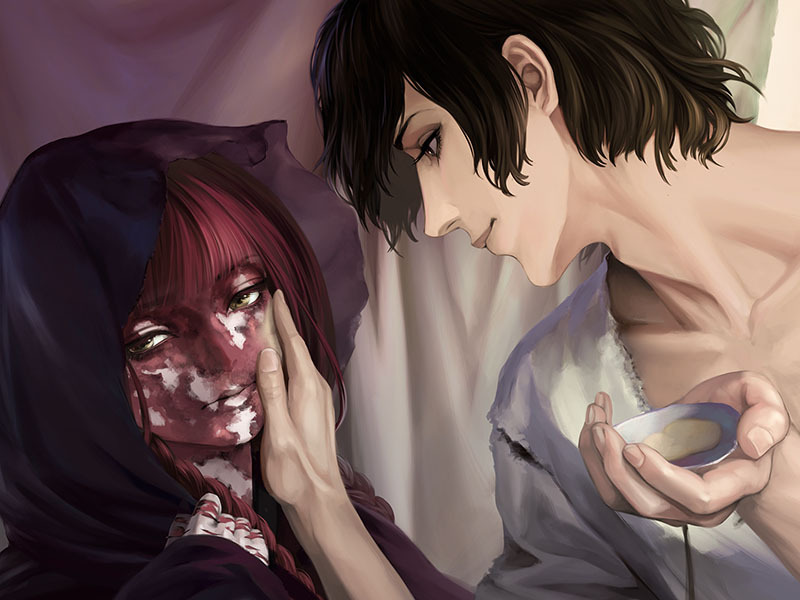 The House in Fata Morgana: A Requiem for Innocence is a fan disc for The House in Fata Morgana. It tells multiple stories set in various times and places that flesh out the story of the original game. If you enjoyed The House in Fata Morgana, I wholeheartedly recommend you read A Requiem for Innocence. The main story here is about Jacopo and Morgana’s lives following the slave uprising which freed Morgana. A couple new characters are introduced, but it mostly focuses on characters from the main game. The first half is about the brothel that took Morgana in and taught her what happiness is. The latter half focuses on Jacopo and fills in some notable omissions in the story as told by Morgana in the main game. A Requiem for Innocence also includes about half a dozen shorter stories. For example, one is about a half-dead vagrant that stumbles onto Michel’s doorstep during his days living at the mansion prior to meeting Giselle. Another is about Giselle and Michel’s first date in the present day. Basically everyone from the main game makes an appearance. Seeing these characters again is a real treat, almost like a class reunion. Except there are cute anime girls in your class. Don’t be mistaken, though — while friendship is a core theme throughout A Requiem for Innocence, the fragility of friendship and cruelty of isolation are just as prevalent, if not more so. The original game certainly had its share of dark times, but they are mostly resolved and outshined by some fantastic uplifting moments. A Requiem for Innocence has some pits of despair that will be sticking with me for a while. I wouldn’t hesitate to recommend A Requiem for Innocence to anyone who liked the main game. The two share many strong qualities (the writing, translation, art, and music are just as good), but A Requiem for Innocence does end up feeling less cohesive, as you might expect from fan disc side stories. They support the main game better than most fan discs I’ve seen, but The House in Fata Morgana comes together beautifully, especially considering how disorganized it seems at first. Still, at the end of the day, A Requiem for Innocence doesn’t disappoint. I’m very grateful that it exists, not just to round out The House in Fata Morgana, but also as an opportunity to revisit that dreary, miraculous mansion. 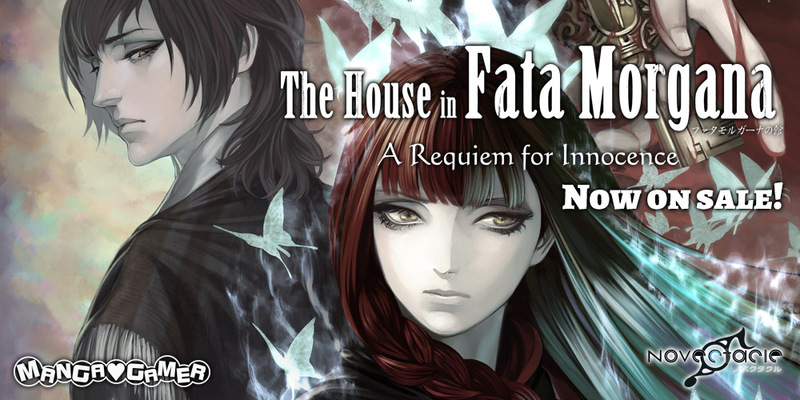 The House in Fata Morgana: A Requiem for Innocence is now available on MangaGamer.com and Steam! Tagged Fata Morgana, Novectacle, the house in fata morgana.